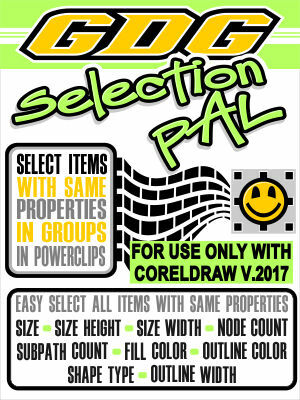 FOR v.2017 of CorelDraw ONLY. Select items on page based on options chosen that match a first initially selected shape. Works optionally inside groups and powerclips. Selection options include Size, Size Height, Size Width, Fill Color, Outline Color, Outline Width, Shape Type, Node Count, Subpath Count. This version is for v.2017 of CorelDraw only. TIP: You might also be interested in GDG Selection Buddy.